Having been sent to Winding Circle Temple, Daja, Briar, Tris, and Sandry begin to feel that they finally found a place where their magical gifts are respected. Reprint. First in a series, this is a rich and satisfying read. The action is swift, the fantasy world nicely defined, and the ending will leave readers wanting more. With a multicultural cast and enough gender role-reversal to make a lot of people happy, this is a promising first title in a series. [T]his is an enjoyable fantasy for middle-grade readers, who will look forward to the next book in the series. Pierce has created an excellent new world where magic is a science...and populated it with a cast of well-realized characters. Teens will eagerly await the planned sequels. I do love a number of other moments throughout the book. Those moments of banter, discovery and amazement are heady feelings. The way Sandry, Daja, Tris and Briar grow, make discoveries and learn about magic together never fail to strike a chord with me and give me a good chuckle and/or smile. I was a huge fan of Pierce's Tortall series growing up. I'm not sure why I never got into the Emelan series back then as well. As an adult, I've actually found that the Tortall books aged quite well, so I decided to give this series a shot. The novel starts by introducing our four heroes (yes, there's four protagonists in these books). Sandry is a noblewoman who survives a plague that kills her parents. She's hidden in a dark room with no windows or doors for a month, slowly losing her mind, until she's found and brought to Winding Circle. Daja survives a shipwreck that kills the rest of the crew, including her entire family, only to be declared unlucky and cast away from everything she knows. Briar is an orphaned thief who narrowly escapes a short life in the mines by being brought to Winding Circle. Tris is shifted from relative to relative, all the while knowing none of them particularly want her around, until she too is brought to Winding Circle. There, the four quickly stand out for one reason or another (largely, they're pretty obstinate and this gets them into trouble) until they're brought together and told they have magic. All in all this book was enjoyable, although with everything split between the four protagonists I didn't feel like there was a lot of time for character development. I also found it a little far-fetched when the kids are told they have magic and none of them believe it. The reader gets to see them doing magic pretty much from page one, so it comes as no surprise to us at least. And for four kids who've never practiced magic before, they seem to get really powerful really quickly. I wish this was slowed down more and given time to develop. That said, I still liked all of the characters. I love how Pierce actually has her characters overcoming hardships, and no one in this series gets to live a cushy life. The four contrasting protagonists also make it so that just about any reader can surely identify with one of them, which I do think is good for a younger audience. All in all I didn't think this lived up to the Tortall series, but it probably isn't fair to compare them. I also still ended up reading the entire quartet, and will probably continue into the next one. 5.0 out of 5 stars13 years a fan and still going strong! 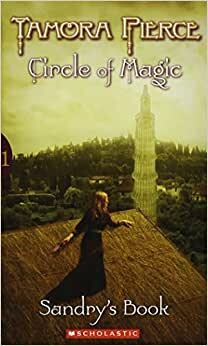 I am re-reading each quartet on the Circle of Magic by Tamora Pierce. I grew up reading these books, and reading them again I feel so grateful to have an author capture diversity and fantasy and the different ways kids grow up in this crazy world and so many other amazing topics all in this series. Really, anything Tamora Pierce writes has touched my life in some way, has given me a new perspective or given me someone to relate to when I though no one could. I've been a fan since I was 12 years old and I know I'll be a fan for the rest of my life. At this point, at 25 years of age, still being able to relate, to be able to reminisce, and to learn more from each of the characters is phenomenal. If you've never picked up her books, Sandry's Book is always a good place to start. And if you have kids in your life, introduce them to this series. I'm waiting very impatiently for my year old nephew, and I shove it into the hands of all the kiddies I know. The plot takes a long time to get going although the beginning feels a bit rushed. Some more development of the four children traveling with Niko to Winding Circle might have helped with that. The emotional heart of the story is the four children from very different backgrounds overcoming their prejudices and distrust for each other to become friends and escape danger at the end of the book. Sandry's weaving magic is fascinating especially at the beginning when she creates light to deal with the darkness surrounding her and at the end where she ties her companions' magics together. 5.0 out of 5 starsAll Pierce's Books Are Reliably Satisfying. A good and essential book that is the second of an excellent quadrilogy for young adults (and older people such as myself). I bought it as a replacement for a volume we lost in our collection. Read the entire series. It takes place in the extended universe of Tamora Pierce, whose sense of the individual and basic values is something special. If you haven't read Ms Pierce's books yet, this series is as good as any place to begin. A lot of her books are somewhat predictable, which can either be a flaw or a gift. In the case of Ms Pierce, it is predictable in the same sense of knowing what to expect from an excellent pie. It is the fulfillment of that expectation that makes these series so addictive. The pirate plot is better developed than the slow one of the previous book in this series. It was neat to see Tris interacting with a family member though it was quite obvious to me from the beginning thanks to what Tris could overhear through her magic that he was the traitor. Seeing the students build stronger relationships with their teachers especially Daja with Frostpine and Tris with Niko was a nice way to extend the bond the children developed with each other in the first book of the series.